If the Emperor from Akame Ga Kill! appears, what should his fate be? One fate I was thinking of is for if he survives his death in the fonte material, he might need to make amends for the horrible things Honest made him do. If Riku made amends for what happened in the first KH game, then who's to say the Emperor couldn't? I'm not sure what kind of fate he should have if he does die, but it can't be anything above an E10+, the fact that he's a child only makes things worse. I can picture that. Sora,Donald and Goofy could become knight Raid Night Raid members. 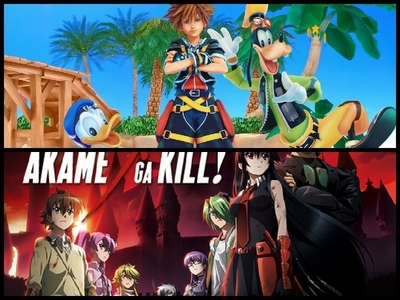 Playing in Akame Ga Kill world Kingdom Hearts style will be epic for Kingdom Hearts 3 lll. The Emperor can be a boss villian o a heartless. Makw for a cool battle KH and Akame Ga Kill style.